Children’s literature is as important to me as adult literature. I love reading children’s books, as well as the ones that I loved to read as a child myself, I love discovering new books that are being published now. 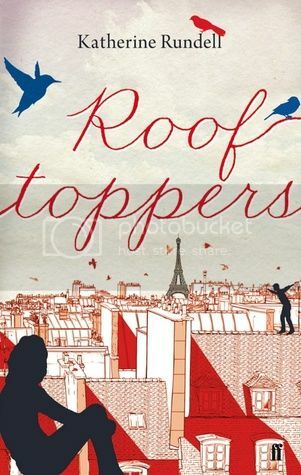 Rooftoppers, by Katherine Rundell, is one such book. It caught my attention when it won the Waterstones Children’s Book Prize earlier this year, so I reserved it at the library and it arrived last week. It tells the story of Sophie, whom everyone thinks is an orphan. She was the only recorded female survivor of a shipwreck which left her floating in a cello case in the middle of the English Channel. She is rescued and adopted by Charles, a fellow survivor, and the two of them live in happy eccentricity for many years. But Sophie can never rid herself of the feeling that her mother survived. She has a memory of her mother waving for help, and this is good enough for her and for Charles. When the authorities tell Charles that he is not a suitable guardian for Sophie, they go on the run to Paris, where they think they will find Sophie’s mother. Evading the authorities, Sophie takes to the rooftops with an orphan named Matteo, and his network of rooftoppers, to see if they can unravel the clues and find Sophie’s mother. Everything about this book is beautiful. 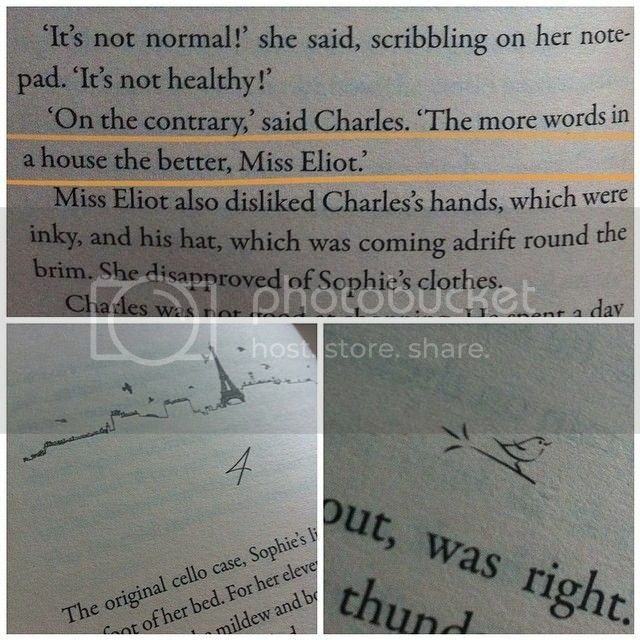 All versions of the cover are lovely, each chapter page has a cute sketch of the Paris skyline, and the page breaks are marked with little birds. Beyond the aesthetics, the writing is just beautiful. Think of night-time with a speaking voice. Or think how moonlight might talk, or think of ink, if ink had vocal chords. Although it is rooted in reality, it feels magical. The beautiful language suits Sophie’s unusual upbringing at the hands of Charles, a man who might not know that buttons differ on girls’ and boys’ shirts, but knows the value of reading, of music, and of making sure Sophie is intrigued about the world. She knows how to read, and how to draw. She knows the difference between a tortoise and a turtle. She knows one tree from another, and how to climb them. Only this morning she was telling me what is the collective noun for toads. When he finds out that she has been scampering across the rooftops of Paris trying to find her mother, he is worried, but he is not angry. He simply accepts that it is something she must do. I did feel that the action of the book sagged slightly in the middle, after Charles and Sophie had arrived in Paris, but before Sophie made the acquaintance of Matteo. It just failed to hold my attention in quite the same way as the early part of the book did. But then, after Sophie has taken her first steps onto the rooftop, and won Matteo over, the magic begins again, and I found myself drawn in once more. It’s a lovely book, and I’d recommend it to just about everybody.